One of the key things director of Warner Music Group Edgar Bronfman Jr. said against the Universal/EMI merger in front of the US Senate Judiciary Committee’s antitrust subcommittee was this: “To put it in context, last year, the largest movie studio, Paramount, had a market share of around 20 per cent. Random House, the largest trade book publisher, was less than 20 per cent. And Comcast, the largest cable operator, had just over 20 per cent of pay television." The danger for jazz music, a tiny part of the overall picture notwithstanding, in such a merger is that historic labels chiefly Blue Note could possibly go into semi-hibernation for a period of some time as the reorganisation unfolds and then become just like any other label to be marketed this way and that. It would be a bit like what’s happened to the Verve marque for long periods under Universal’s stewardship. Artists that might have appeared on Blue Note could well be having “Universal Music" slapped on their records or some compromise construct, a blanding out that means nothing except it’s music from a big company that could be selling soap powder or ball bearings. It has no connection with the soul and heartbeat of the music whatsoever. Labels used to have this crucial element at their core, big or small, and many still do. Surely the wheels should come off this deal if such strong objections are registered, and Bronfman has made an important point. The chilling thing is that should the deal go through Universal/EMI combined would have a huge 42 per cent US market share. 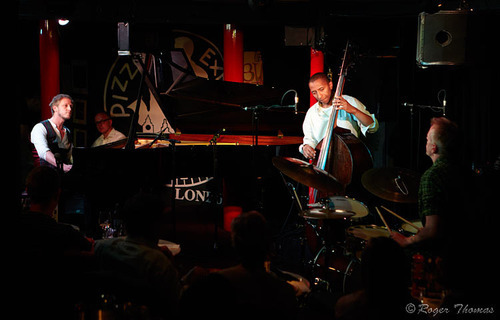 Arriving earlier in the day by plane from Hamburg, where they have been recently working on the soundtrack of a television drama, Tingvall Trio made their UK debut last night at the Pizza Express Jazz Club in Soho. Tingvall trio, that’s Swedish pianist Martin Tingvall based like Cuban bassist Omar Rodriguez Calvo and German drummer Jürgen Spiegel in Hamburg, are a big deal in Germany winning ensemble of the year at the Echo awards and charting at number one in the German jazz charts. Their previous albums Vattensaga (2009), Norr (2008), and Skagerrak (2006) have each sold around 15,000 copies, and their latest album Vägen (‘The Road’) has just been released in the UK by their long time label Skip, like the band based in Hamburg. Martin Tingvall, 37, was born in the southern Swedish province of Skåne and studied jazz piano and composition at the Malmö Academy of Music moving to Hamburg in 1999 and founding the trio four years later. Tingvall writes the songs, which have an anthemic nuanced feel, and the band is frequently compared to EST, whose last ever UK club appearance was coincidentally in Pizza Express Jazz Club during a lunchtime industry event held by Jazzwise celebrating its tenth anniversary. Spiegel, the oldest of the group at 40 has a background in rock and African music, while Calvo two years younger has a wonderful ringing tone in the tradition of the late great Orlando ‘Cachaíto’ López tempered with the European sound of say Palle Danielsson. The trio has a contrapuntal style that draws out prettily punctuated themes, but retains a sense of drama despite the accessibility, and features some real improvising, with an obvious unforced band empathy throughout. Opening with ‘Sevilla’ from Vägen and bookending the first set with the album’s hooky title track, Tingvall’s first inspiration was McCoy Tyner but he has a style that does not betray this first love. With an impressive lightly worn technique Tingvall’s naturalistic style encourages an emotional kinetic connection with the audience, and, looking around, people responded with smiles of recognition, and warm applause that got progressively greater as the evening went along. Most of Tingvall’s songs have Swedish titles, and the band also played ‘Trolldans’ from earlier album Norr, and the devastating ‘Movie’ from Skagerrak as well as material from Vattensaga (‘Water stories’). It’s taken years for the band to play in this country; let’s hope it will be only a short time before they return, so many more audiences can experience their intuitive musicianship and refreshing intelligent approach to the jazz trio. The Forge in Camden may well have that Friday feeling this week as guitarist Hannes Riepler beams in with a pretty extraordinary band to launch his debut album The Brave. Riepler is pretty special himself, and since taking hold of the Tuesday jam at Charlie Wright’s in Hoxton over the past two years, the Austrian has got himself firmly established. In his early-thirties he has written all the tunes on The Brave, just released by Huddersfield indie jazz label Jellymould. With roots in the acoustic jazz of the 1950s and 60s, he’s joined on the album and at the Forge by piano star Kit Downes; Ma saxman Tom Challenger; Cornish bassist Ryan Trebilcock; and Kairos 4tet drummer, Jon Scott. The album is urban sounding at times, despite the mountain air evoked in ‘Tyrol, Tyrol’, the song Riepler says charts his journey from his homeland to the big city, Amsterdam and now London. Playing a 1980s Gibson Chet Atkins Country Gentleman that evoke sounds steeped in the tradition with an ear to the ground for contemporary jazz guitar particularly post-Kurt Rosenwinkel, Riepler is raring to go. Check him out, you might be too. After 33 years the emergence of Sleeper is a seismic event the significance of which will be felt for years to come. Listening to the 28-minute version of ‘Oasis’, the flute/percussion flavoured track on the second CD of the Keith Jarrett ‘European Quartet’ album – some 10 minutes longer than the rendition of the composition you’ll find on Personal Mountains – it’s hard to avoid thinking about Jarrett’s former employer Charles Lloyd. 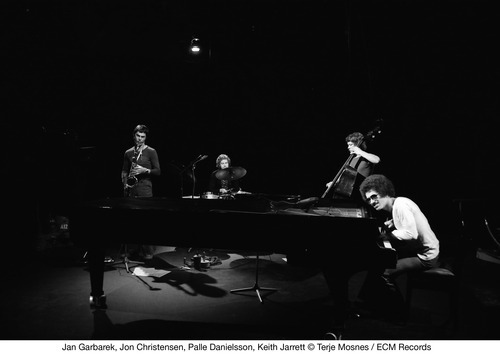 Jan Garbarek has always had an unworldliness about him, just like Lloyd, a mysticism too, and there is a sense of this here that Garbarek is placeless, operating not in 1979 when the music was recorded and is now released for the first time, but in the ancient past. The song feels as if it could have been performed in a cave, or on some lonely plain with just the four musicians present, but yet it’s in front of an audience in Tokyo. Jarrett possibly contributes percussion effects on this track as well (it sounds as if there’s more than Christensen at work), but even if this is not the case his role here is different to say that on the wondrous ‘Innocence’ from the first disc. Towards the latter part of ‘Oasis’, an informal but no less grand symphony of a piece, both Garbarek and Jarrett become more emotional on the song, as if some switch has been turned on, and it’s the level of intensity that makes the European Quartet so special not just here but made blindingly obvious with this release. There is something quite naïve about the level of motivation on Sleeper which in artistic terms is almost like a surrender, and it’s easy for a listener to sense this sheer abandon. In a year when remarkable new music has already been unearthed from the archives (the game changing early-Wes Montgomery Echoes of Indiana Avenue set from Resonance; and 301 the beautiful Sydney swan song by EST), Sleeper is still a milestone and adds hugely to what we know about the Belonging band.